One of the joys in my life is having a job that I absolutely love. The saying…”do what you love the the rest will follow”…is so unbelievably true. I’m not saying it comes without frustration and worry, because building a new business is definitely full of fear and great apprehension…but it’s also full of amazing people and wonderful opportunities. This year, I’ve had the pleasure of working with some wonderful people through Drawbridge Creative, Curtains are Open, and East Coast Mom Media…my newest adventure. Never in my wildest dreams would I have thought I’d be able to find an outlet that allows me to be paid to be creative…and people like and appreciate what I do. Going back to school to pursue a new career was definitely the right thing to do! It allowed me to pull together my business background, my years of working and teaching in the IT industry…and a two-year course in Graphic and Web design to all come together in the most wonderful way. The perfect storm! This year, I branded four new start-ups! I sat in my office and listened to the dreams of entrepreneurs (who all happened to be women) as they excitedly told me about their new business adventures. I felt the thrill they felt as we came up with ideas for their products and services…and then put our ideas into action. I’ve met remarkable women who are chasing their dreams and I feel privileged to be part of it. I have felt the thrill, each and every time I’ve received an email asking me for a quote…the excitement with each new client…the pride, in completing a project. 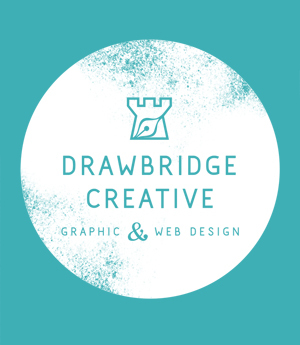 It’s been a fantastic year for Drawbridge and I look forward to the year ahead. A HUGE thanks to my Dad, my mentor, who provides years of experience and hours of advice…who discusses each project with me and is just as excited when I land a new account as I am. Thanks as well to Matt Bustin…my partner in crime…who critiques my work and jumps in on a moments notice if I’m in over my head and need a second set of hands (or something drawn…we all know I can’t draw!) Also, a big thanks to the Centre for Women in Business for helping me along as I’ve needed it…most especially to Nora Perry, for her smile, encouraging words, sound business advice…and simply for believing in me. There was a time I thought I’d keep these two businesses separate…where I looked at Drawbridge as my career and Curtains…and writing…as my hobby. However, both are blending in the most fantastic way. This year, I was lucky to be able to attend Blissdom Canada where I met some of my amazing blogging friends and mentors…including Shannon Mischuk and Jennifer Powell. I have had the great privilege of working with Erica Ehm’s Yummy Mummy Club, the folks at Mom Central, some fantastic PR companies, Target, Telus, Netflix, and most recently KIA. I have worked on exciting campaigns including large brands and local companies…every single one, an opportunity to grow my blog and challenge my writing. This year, I was thrilled to work on a Dove campaign and hear how my own daughter defines her mom as beautiful…it continues to be one of my favourite posts for 2014. Curtains is a joy. While it’s beginning to make money and winning awards..to me, it’s so much more. Curtains allows me a place to share my views on life and parenting, to rant, to make fun of myself, to tell stories about my children, to open up about my divorce and the challenges that have gone along with it, to tell you about my amazing friends and family, to laugh and cry and in the process…inspire others. Curtains is a place to share my views and make a whole whack of people out there realize that we’re all the same…where “normal” is a little bit crazy…and crazy is a whole lot of fun! While I work with brands, Curtains will always continue to be my own voice…my own views. Everything I write, comes straight from the heart. Curtains has given me far more than I’ve been able to give back…I owe the readers of this blog a debt of gratitude I will never be able to repay. The writing was on the wall…or at least on the Facebook wall. A few months back, myself and two other bloggers, Laura Snow and Heather Nolan, joined forces to create East Coast Mom Media. We’ve combined our expertise to show East Coast companies what we can do! What blogs can do…the power behind social media. We’ve begun with our weekly #ECMChat. An online Twitter chat on Wednesday evenings at 9PM…bringing together moms, bloggers and local companies…having a little chat about a weekly topic, with a giveaway at the end from one of our local sponsors. ECMM is only just beginning…and there’s so much more in store! Over the next few weeks I may write from time to time. I may clean out my office…do a little filing, organize some marketing, update my website with the work I’ve done this year and create a new site for ECMM. I may find time to fit in a few things that need to get done but for the most part…I’m off. I’m putting my feet up, pouring a drink…I plan on spending a bit of time with my family to re-group…relax…give my brain a little rest…reflect on the year gone by and the one ahead. I have much to be thankful for. I’ve found a job I love…a job I’m passionate about…and everything else is falling into place. Just like they said it would. Thank you for being a huge part of my life in 2014. I look forward to the year ahead…the joy it will bring…and our continued friendship. This entry was posted in Blogging, Graphic Design, I <3 Local, My Own Business by Colleen ODea. Bookmark the permalink. This is fantastic! I am so happy things are going so well and coming together for you. Three businesses! Wow! That is amazing. I’d love to start my own va/web design biz one day (may have to go back to school to update my skills for web design tho) but just started a full time job out of the home at the beginning of the month. So sadly my blog is taking a back seat right now. Glad to gave met you at bliss this year!